Sometime when you lost the phone your first tendency may be to immediately locate your lost phone. Most of the person don’t have any idea what to do at this situation. There is no need to worry after reading this guide you can easily find your lost phone with Android device manager on Google. Google search provide the facility to easily find your lost phone with Android device manager. The Android device manager allows you to find the approximate place on the map when you was last used. With the help of Android device manager you can ring, locate , enable lock and erase important data from your lost phone. But this feature work properly when your device location access is turned on and signed into the Google account. If you don’t active any one then you will not be able to find your lost phone with Android device manager on Google. 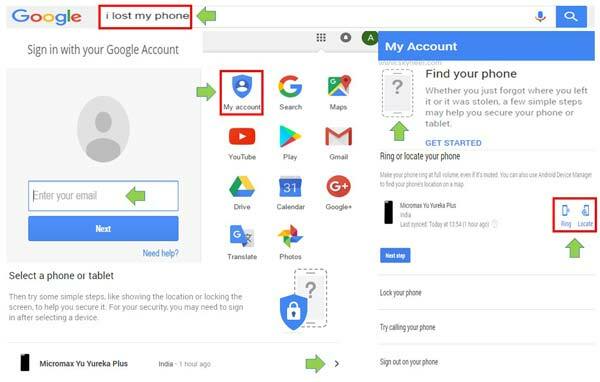 If you want to give demonstration how to find your lost phone with Android device manager on Google then you just type “I lost my phone” into the Google search box and press enter. But first you have to ensure that location services turned on and synced with your Google account. Now Google allows you to easily trace your lost phone within 50-100 feet or metres. You have to fill your Google account user name and password to sign in into your Google account to trace your lost phone. If you have more than one devices then click on the device name which you want to find. Android device manager automatically start finding process of your lost phone. You have to click on the top right corner and choose “My account” option. Now scroll the My account page and locate “Find your phone” option. Now click on the “Find your phone” icon to start the searching process. It’ll shows your device name in the “Find your phone” page. Now you will get lot of option which helps you to find your lost phone with Android Device Manager on Google. Once you properly locate your lost phone, you can remotely ring, lock, or erase data with the help of Android Device Manager. Ring: If you want to give ring on your lost phone then you have to click on the “Ring” option. After sometime your lost phone is ringing. Locate: If you want to search approximate location of your lost phone then you just click on the locate option. Enable Lock & Erase: If you think someone break the lock of your phone and view your important data then you have to turn on this feature. This feature allows you to turn on lock feature and also erase all important data from your device. If you got your lost phone and don’t want any other advantage from Google then you have to sign out remotely by clicking on the “Sign out” button. Note: If you lost you phone then it is advisable to immediately contact with your operator to lock your sim. You can also report to nearest police station to file the report of your lost phone. You have to take care of your phone. If you lost of your phone then you have to face different kind of problems. But if you face that type of situation then this article helps you to easily find your lost phone with Android Device Manager on Google. If you have any suggestion regarding this article then write us in the comment box. Thanks to all.